Lenovo ThinkCentre M73 10AY Desktop PC Intel Pentium G3240T 2.7GHz 4GB RAM 500GB. For large enterprise(EDU/GOV/PUB etc.) with a need for an essential desktop PC, the ThinkCentre M73 provides the latest Intel technology at a competitive price without sacrificing security, stability, manageability, and green environment. Make your IT deployment count with the entry-level M73 Tiny, an affordable-but-powerful, compact desktop PC. The ThinkCenter M73 is a great choice for your enterprise. Complete with flexible mounting solutions, Tiny desktops fit just about anywhere, yet they provide a reliable, enterprise-level performance that you can depend on. 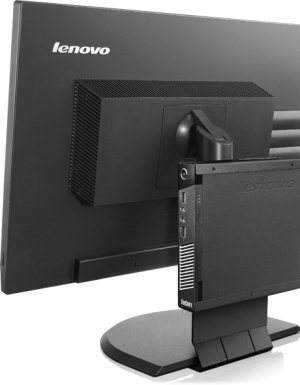 If you choose to mount this compact unit on the back of your monitor, you can still power on conveniently from the front, by simply pressing Alt + P.
Lenovo Solution Center provides access to a simplified dashboard that reflects total system health. 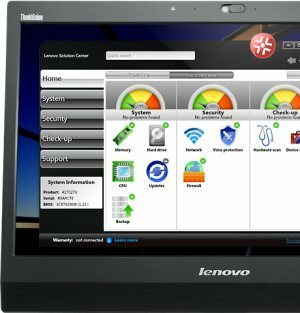 This hardware diagnostic tool allows quick access to frequently used system management tools, including backup and restore, antivirus and firewall settings and system/software updates. Move data between the M73 and other devices quickly with USB 3.0.